I have been insanely stressed the past couple of weeks. This has been caused by my applying to grad school on the fly. I was going to apply, and going to apply. But the application wasn't up for the longest time. By the time they put the application up, I was so sure that I didn't stand a chance of being accepted. So I didn't finish it. Plus, the application fee was 50 dollars, which is a ton of money for me right now between paying a mortgage and bills, etc. I finally got up the courage (and funds) to apply. And I have until the end of the month to get everything in. Luckily, I already had several things ready. So I ordered and sent all of my transcripts. One didn't make it. After almost two weeks, I had to call in a panic and have them send another copy. The coordinator keeps up with what they receive from me, which helps. So all my transcripts made it. Good. I sent my letter of interest and resume priority mail, which they got. They had my GRE scores from last year. Which leads me to my three letters of recommendation. I thought I had three lined up from last year. Apparently I was wrong. My mentor from my internship sent his right away (of course, I had a copy of it that I attached and sent) because he's sweet and amazing. One of my teachers couldn't because of the time constraint. Which is really my own fault. That was upsetting, but luckily I lined up a couple of backups. So my previous manager and friend wrote me one and it was sent and has been received. Sadly, it is not an academic letter. Last year when I researched, I was supposed to send academic letters, but the coordinator didn't say anything about that in her e-mails, just "letters of recommendation." I figure three total is better even if one is not academic than only having two. So that's great, right? One of my teachers has been busy and on vacation. She was my favorite teacher so I really, really want her letter, but she hasn't written it or sent it yet. I am seriously on edge waiting for her to return. She said she would write it, so I hope it's in time. It makes me sick to think about it. But at this point, there is really nothing I can do. She gets back Monday and the deadline for receiving my letter is April 1st so it has to get written and sent ASAP. But I don't want to be mean and pressuring so I haven't said anything to her. I e-mailed her the documents she asked for and I told her the deadline. What else is there, right? Except that I am super stressed about it. In addition, I have been working more than 30 hours for the last few weeks. I actually am almost hitting 40. And I have three tutoring students that I have to prepare lessons and review for and then there is time actually spent meeting them. And I got a new student on the fly. So I work almost 40 hours per week and do hours of review and prep almost every day and then I actually meet my students. Needless to say, I have been insanely stressed. 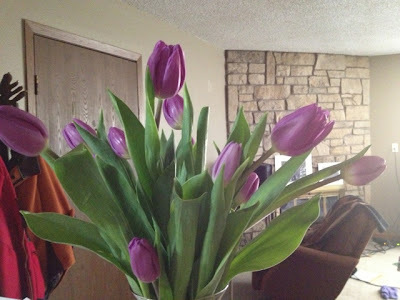 For a while, I was so stressed and anxious that I could hardly sleep. Then it changed. I became so stressed that every time I began to feel overwhelmed, I was completely overcome with exhaustion. Which wasn't really helpful, honestly. On the plus side, I was sleeping. Sometimes during tutoring prep I would literally fall asleep over my notes and take naps. I drank tons of coffee and had no trouble sleeping all night long. I guess the sleep was nice, but I never felt rested. At work, I'd start to worry about letters and about tutor prep and I would just get so tired I could hardly function. As you can imagine, I haven't been the best person to be around, and I think Isaac bore the brunt of that. Isaac promised some fun on Saturday, my only day off. Now that the school has everything except that last letter, and all my students are on spring break next week, I just had to make it through work this morning until I could catch a break. On one of the worst days, Tuesday, after my horrible meeting with my teacher who couldn't write my letter (not actually horrible because she couldn't write it, but because I am so awed and intimidated by her that I make the biggest fool of myself when I'm around her, which doesn't even give me a chance of earning the approval that I so desperately want from her-it was very emotionally and physically draining-still is, I guess) that I bought these lovely tulips for myself. Thursday I had my last two tutoring sessions. I drank SOOO much caffeine that day. I actually don't want to tell you how much because I should probably be ashamed. But I had to stay awake to finish prep and go to my sessions alert and motivated. So I drank lots of coffee all day long. I worked in the morning, of course. Then I came home to prep. But, to relieve a little stress, I decided to take a long, luxurious shower! I used some of my nice, expensive detoxifying soaps and scrubs. I shaved my legs. It was so nice and relaxing. I almost felt guilty taking that much time for myself, but I definitely needed it. I felt like a new woman after that-a woman who could get through the tutoring prep, tutoring sessions, and work this morning! So nice. 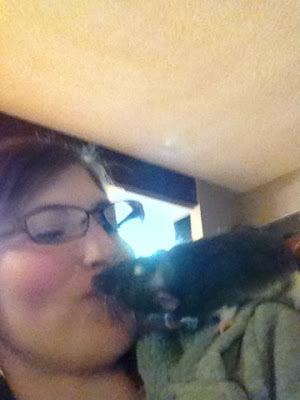 And then Isaac and the rats have helped out here and there. 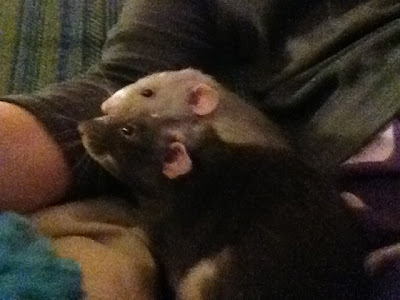 Aww, cute ratties! Don't you just love them?! 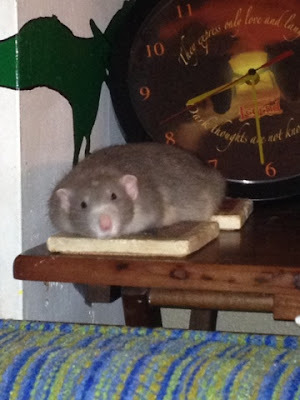 The cutest picture of Remus being a flat rat! He was out playing and decided to just chill for a while!